“Fill-the-words” is a word-finding game offering several hundreds of levels of intellectual excitement. Search for hidden words while cute monsters help you along the way. The square field contains letters. 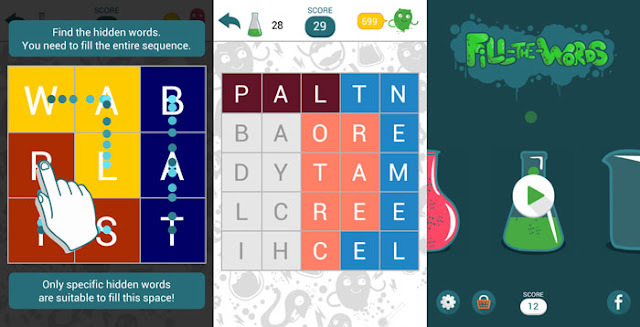 Find all of the words by selecting adjacent letters so that the words fill the entire cell. Below you can find the answers for the first 100 levels in Fill-The-Words, more levels will be added soon. You can leave a comment and request the answer to a level that's not on the list right now, and I'll replay with the solution.